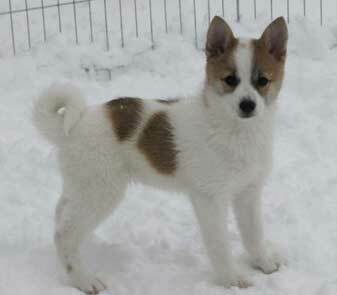 17 century and shares ancestry with Finnish Spitz. 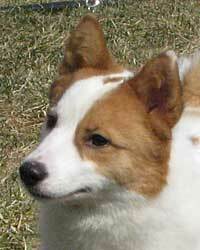 It was imported to Canada in early 1990’s and recognized by Canadian Kennel Club in 1996. As pack hunters in their native countries, they could sight and scent anything, from birds to moose. 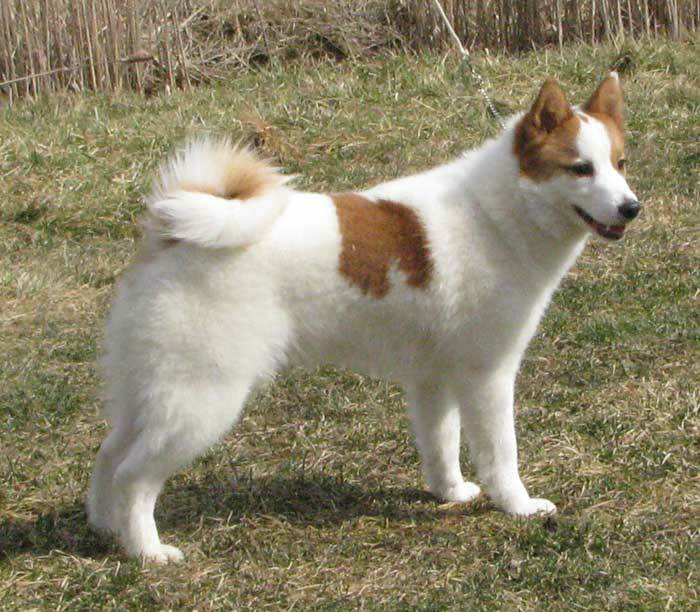 General Appearance: Medium sized spitz type, strong and agile, very alert and confident. Head is wedge shaped and ears are rectangular and erect. Body is short strong and muscular. Tail is carried loosely curled over back and the tip touches side of thigh. Coat and Colour: Double coated, the outer hair is short and firm but soft, and under coat is dense and soft, easy to keep clean and groomed. Will ‘blow’ or shed the coat once per year. Can be any colour. The ideal is a white base coat with yellow or red/brown markings. family. Will bark to alert and do bark when hunting. Activity: Active dog, not sedentary, no exercise limitations, can walk jog or bike with the owner, and good in the water. They can actually climb a tree if they go after a squirrel. Very few health issues but reputable breeders test as a precaution. Norbottenspets enjoy a long life span of often 18 or more years being quite common. Diet: any good quality kibble. Training: Formal training recommended, they can be trained in obedience, agility, tracking and specialized training such as search and rescue, cadaver search and drug sniffing. A five foot fenced yard/enclosure will suffice but may they may try to dig out.